Which of these social-media titans should investors buy today? 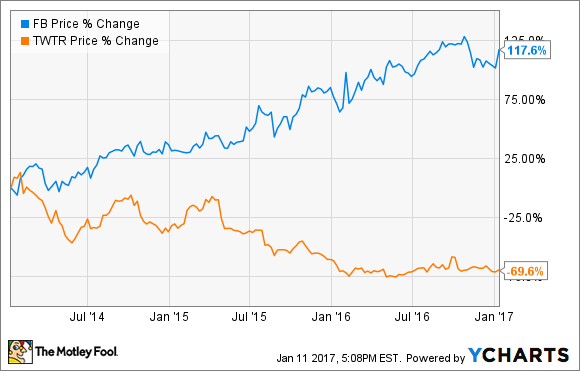 Facebook (NASDAQ:FB) and Twitter (NYSE:TWTR) are on very different trajectories. Over the past several years, Facebook's stock has more than doubled, while Twitter's shares have lost nearly 70% of their value. More important for today's investor, however, is the likely trend from this point forward. Will Facebook's stock continue its ascent? Are Twitter's shares poised for a sharp rebound? And which of these stocks is the better buy today? Read on to find out. Facebook is easily one of two dominant players in the digital advertising arena. With nearly 1.8 billion monthly active users, Facebook's scale is unmatched. Facebook's network dwarfs that of its competitors, which has made gaining access to its platform increasingly important to advertisers around the world. The rich data Facebook collects on its users allows advertisers to better target their ads, increasing their usefulness to users and therefore their value to marketers. That, in turn, leads to greater revenue and cash flows for Facebook, which it can then reinvest in improving its services and acquiring new technologies. It's a virtuous cycle that, when combined with Facebook's powerful network effects, help form a wide moat that will insulate the social-media king's profits from the clutches of its competitors. Twitter, on the other hand, has struggled to grow its user base, which have plateaued at around 300 million. Worse still, analysts have begun to lambast the quality of Twitter's user data. Twitter's data quality is "horrible," according to Global Equities Research analyst Trip Chowdhry in a research note shared with CNBC. "If data quality is bad, ad targeting is bad, and if ad targeting is bad, advertisers are not happy, and hence monetization will remain challenging for Twitter," added Chowdhry. These concerns are also reflected in Twitter's year-over-year growth rates. Twitter's third-quarter revenue increased just 8%, to $616 million, on a 3% uptick in its monthly active user base, to 317 million. Contrast that with Facebook, which, despite its far larger size, saw its revenue surge 56% to $7 billion, as its MAUs jumped 16% to 1.79 billion. Looking ahead, Facebook's growth is likely to continue to outpace that of Twitter. Analysts expect Facebook to grow its earnings by more than 36% annually over the next half-decade, compared with 30% for Twitter. Another often-underrated factor that may help to explain Facebook and Twitter's divergent performances is the quality and stability of their executive ranks. Facebook CEO Mark Zuckerberg is one of the most highly respected business leaders in the world today, with an impressive 98% approval rating from job listing and employee review site Glassdoor.com. Zuckerberg leads Facebook with the passion and long-term vision of a founder, and has strengthened his leadership team with outstanding hires such as COO Sheryl Sandberg. What's more, Facebook is constantly bolstering its leadership ranks via "acquihires" (the practice of recruiting top talent through acquisitions), which has comprised an important part of its competitive strategy for much of the last decade. Twitter, however, has recently suffered a mass exodus among its executive staff. Most worrisome, as my colleague Anders Bylund and CNNTech writer Seth Fiegerman point out, is that Twitter lost six of its 10 most senior leaders in the past year. Also of concern is that CEO Jack Dorsey splits his time between Twitter and Square, the payments company where he is also chief executive officer. Despite claims to the contrary, this must make it difficult, if not impossible, for Dorsey to devote the time and attention necessary to improving Twitter's operations and culture -- a view supported by his somewhat lackluster 70% approval rating on Glassdoor, as well as Twitter's continued operational struggles. All told, Facebook has Twitter outclassed on nearly every important metric. From scale to growth to leadership and culture, Facebook is the clear leader. At this point, Twitter's shareholders may be best served if the company were to be acquired by a larger rival, but with several potential bidders deciding to walk away from a deal, an acquisition seems less likely, at least at Twitter's current share price. And the struggling company faces a difficult road ahead as a standalone business. On the contrary, Facebook is a behemoth with more than $26 billion in cash in its coffers, which allows the company to gobble up smaller competitors and innovative new technologies. Even better, Facebook's core business is poised for strong gains in the coming years. As such, Facebook is the better buy today.